Everyone can play a part in fostering the future leaders in science, technology, engineering, and mathematics (STEM). 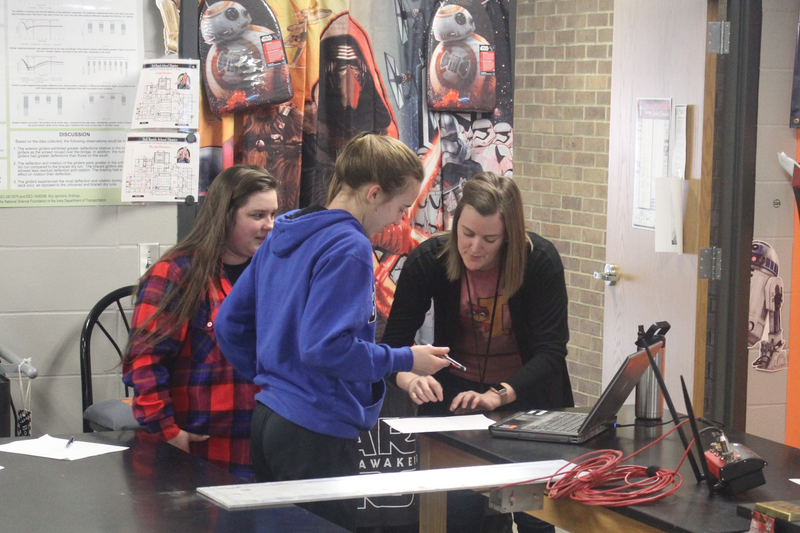 That includes the staff at the Bridge Engineering Center (BEC) at Iowa State University’s Institute for Transportation (InTrans), and it’s why BEC Associate Director Katelyn Freeseman recently spent a day with high school students in South Dakota. Freeseman joined the classroom of Darwin Daugaard, who teaches in Dell Rapids, S.D., so they could share with students the research the pair had worked on together this past summer as part of the Research Experiences for Teachers (RET) program. Daugaard worked with Freeseman on a project regarding exterior girder rotation. To bring that research into the classroom, the students investigated the effects of loading a sample beam. They pushed on the beam with varying levels of strength, for different periods of time, then looked at the data collected from gages that measured the strain and displacement over time. 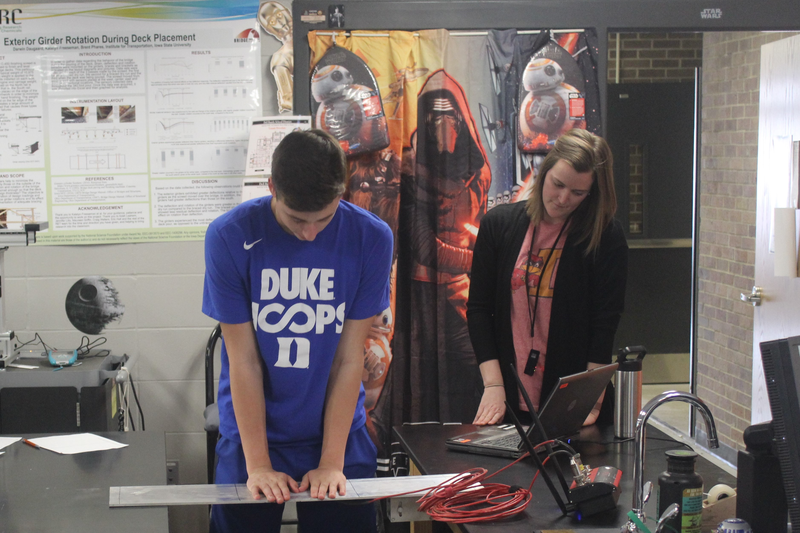 “I think the students enjoyed comparing their results with each other and to see how the data they graphed corresponded to the different load types they applied,” Freeseman said after the visit. While it was a valuable lesson for students, Freeseman sees a greater purpose to the classroom visit. Daugaard knows that goal matters for all students. “Our state — as many others — is in or will be in dire need of STEM workers in this field of construction at all levels of expertise. I feel it is partly my responsibility to help fulfill those needs,” Daugaard said. Freeseman said the visit was beneficial for her as well, because outreach activities offer a valuable perspective. She said researchers like herself can get hyper-focused on data and their in-depth projects, so it’s important that they take a step back and look at their work from the younger generation’s eyes to see the broader implications of engineering. The RET program, hosted through ISU’s Center for Biorenewable Chemicals and funded by the National Science Foundation, provides high school teachers with opportunities do research and build relationships with professionals in STEM fields, so that the teachers can bring new learning experiences to their students. More information about the program can be found here.